CONTRATACIÓN PARA LA ADJUDICACIÓN DE LA CONCESIÓN ADMINISTRATIVA DEL USO PRIVATIVO Y EXPLOTACIÓN DEL BIEN DE TITULARIDAD MUNICIPAL CON DESTINO A LA INSTALACIÓN DE UN GIMNASIO. EXPOSICIÓN AL PÚBLICO DEL PADRÓN DEL IMPUESTO DE COBRANZA DEL SUMINISTRO DE AGUA POTABLE, RECOGIDA DOMICILIARIA DE BASURAS Y ALCANTARILLADO 3º TRIMESTRE DE 2018. SOLICITUD LICENCIA AMBIENTAL PARA LA ACTIVIDAD DE SUPERMERCADO CON APARCAMIENTO ANEXO. ACUERDO DE NOMBRAMIENTO DE JUECES DE PAZ TITULARES Y SUSTITUTOS A LAS POBLACIONES DE LA PROVINCIA DE ÁVILA QUE SE RELACIONAN COMIENZA POR BONILLA DE LA SIERRA Y OTRAS. 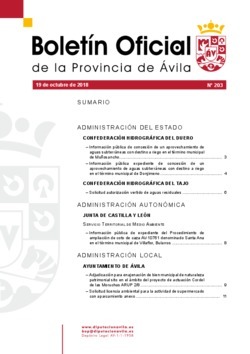 INFORMACIÓN PÚBLICA DE EXPEDIENTE DEL PROCEDIMIEMTO DE AMPLIACION DEL COTO DE CAZA AV-10761 DENOMINADO SANTA ANA EN EL TÉRMINO MUNICIPAL DE VILLAFLOR, BULARROS.